The only historical comparison to what is happening right now in Brazil was in 1968 in Mexico City. We must be vigilant in making sure they don't end in the same way. One has to hearken back to 1968 in Mexico City, when thousands of students and workers marched against the Olympics, to find a sports-related demonstration that compares to the size and militancy of the mass anti–World Cup/Olympic uprising taking place in Brazil. As in Mexico City thousands of people in Brazil are in the streets—and outside stadiums hosting Confederations Cup matches—raising slogans that connect the spending and austerity that surround these mega-events to a much deeper rot in the nation’s democratic institutions. As in Mexico City the central question is one of priorities: spending for sports while other vital needs—health, education, transportation—go unheeded. As in Mexico City, the spine of protesters is disaffected youth, educated beyond their parents’s generation because of expansions in higher education, but without jobs or opportunity when leaving the academy. As in Mexico City, the ruling elites feel a desperate need for the events to go as planned as a way to demonstrate to the world that Mexico is a leading player in the game of nations. True to his word, Neymar starred in the victory against Mexico. The differences are also crucial to recognize. In 1968, the student and workers movement in Mexico City was politically organized with many protesters being aligned with the National Strike Council, an organization that had delegates from 240 schools. Their demands were public and organized. 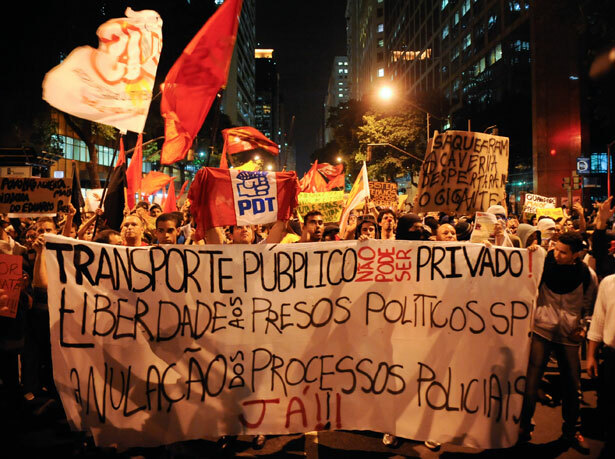 The protests in Brazil can be better defined as being far more an expression of extreme anger and disaffection. While polls of mass demonstrations should be taken with a grain of salt, one survey of demonstrators shows that 84 percent don’t ally with any political formation. It’s a catch-all for every grievance under the sun, with the World Cup and Olympic spending becoming symbolic of an austerity economy beyond the reach of any semblance of democracy. This character is both a strength and weakness. It’s a strength because the country is learning lessons in real time about democracy in the streets, with city officials already repealing the hated proposed bus fare hike in an effort to quell demonstrators. It also is a weakness as forces from the right wing are entering the fray, hoping to turn demonstrators against the Workers Party government and to make this an issue about “government spending”. It’s a cheap, opportunistic effort to deflect attention from the corporate feeding frenzy in conjunction with Workers Party, which is actually taking place behind the green curtain. It also deflects attention from the fact that the right wing in Brazil has no problem with austerity, just with who is administering it. Brazil isn’t the only country coming under criticism for its audacious spending on sports. Dave Zirin writes about the corruption and abuse at the backbone of Russia’s 2014 Winter Games.